This article focuses on the topic ---Display the pdf title in the title bar of pdf reader using Advanced PDF Tools Command Line. Advanced PDF Tools Command Line is an ideal assistant to edit pdf files, because it makes hiding or displaying menu bar, tool bar, window UI, doc title as well as a wide range of functions available. 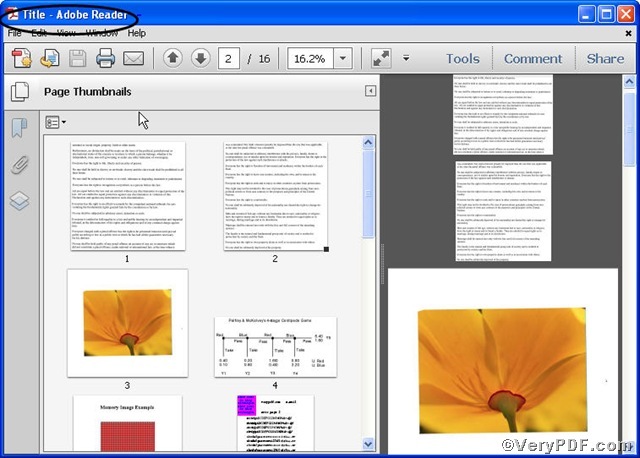 Now, the rest part will demonstrate that display the pdf title in the title bar of pdf reader. pdftools -i "C:\input.pdf" -o "C:\output.pdf" -n "DisplayDocTitle true"
You are fully aware of that the pdf title displaying here is Title instead of testtitle.pdf. In a word, the operation proves that display the pdf title in the title bar of pdf reader has met with success. More command lines on how to edit pdf, you can refer to Advanced PDF Tools Command Line User Manual or just visit at http://www.verypdf.com. How to edit pdf bleed box using command line?